Non-invasive techniques like urinary biomarkers and multiparametric Magnetic Resonance Imaging (mpMRI) show great promise for the detection of clinically significant prostate cancer (PCa), leading to a reduction of over-diagnosis and over-treatment. Apart from yet to be established diagnostic accuracy is the systematic use of mpMRI challenging due to the high cost of setting up, staffing and maintaining a mpMRI unit. Upfront risk stratification could significantly lower the cost of mpMRI by excluding low risk subjects for high grade PCa. The aim of this study was to assess how an established urinary biomarker-based risk score (SelectMDx®) combined with transrectal ultrasonography (TRUS) could be used to exclude low-risk subjects from undergoing the mpMRI procedure. The analysis was performed on previously published patient cohorts (A, n=529 and B, n=386) using a commercially available biomarker-based risk score model (SelectMDx). Of these two cohorts (A and B) 144 subjects underwent mpMRI and TRUS on their first biopsy. For these subjects, the SelectMDx risk score combined with TRUS was calculated, together with their PI-RADS scores (version 2). The inclusion cut-off for the model was set to 10% chance for high-grade PCa (≥ Gleason Score 3+4). Positive mpMRI was defined as PI-RADS score 4 or 5. There were 23 subjects with a Prostate Gleason Grade (PGG) of 2 (GS=3+4) PCa upon biopsy and 27 had a PGG Grade >2 (GS 4+3 or higher) (Table 1). The performance of the SelectMDx + TRUS model to detect PGG 2 and ≥PGG3 was determined on cohort A+B. The diagnostic performance of SelectMDx + TRUS showed an AUC of 0.89 and outperformed PCA3 (AUC 0.68) (Figure 1). Analysis of the subset of 144 patients with mpMRI data (Table 1) showed that 35% (50/144) were low risk for high-grade PCa. These men underwent mpMRI and 22% (11/50) had a PI-RADs score 4 or 5 of which only 1 had PCa (PGG 2). For 62% (94/144) SelectMDx + TRUS high risk subjects, 80% (75/94) were positive for mpMRI and would have resulted in the detection of 48 PGG ≥2 PCa’s of which 54%(26/48) was ≥PGG3. SelectMDx + TRUS missed only 1 PCa sample with a PGG grade of 2 (0.7%) and none of the ≥PGG 3 PCa’s. MpMRI missed one sample with PGG 3 PCa. This study clearly shows that the biomarker based SelectMDx risk score combined with TRUS information did not miss any of the ≥PGG3 PCa’s. SelectMDx and TRUS before mpMRI may result in a significant reduction of unnecessary mpMRI and respectively biopsy procedures. 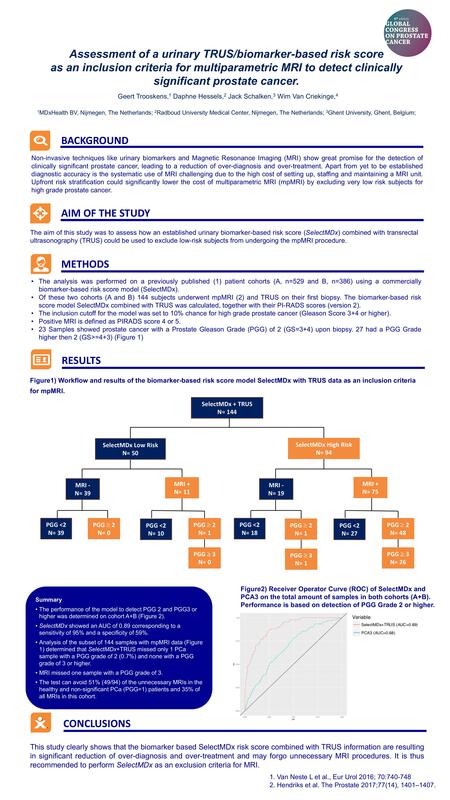 Table1: Decision tree and results of the biomarker-based risk score model SelectMDx with TRUS data as inclusion criteria for mpMRI. Figure 1: Receiver Operator Curve (ROC) of SelectMDx and PCA3 on the total amount of samples in both cohorts (A+B). Performance is based on detection of PGG Grade 2 or higher.